In a recent study in Nature, we introduce a form of memory-augmented neural network called a differentiable neural computer, and show that it can learn to use its memory to answer questions about complex, structured data, including artificially generated stories, family trees, and even a map of the London Underground. We also show that it can solve a block puzzle game using reinforcement learning. Plato likened memory to a wax tablet on which an impression, imposed on it once, would remain fixed. He expressed in metaphor the modern notion of plasticity – that our minds can be shaped and reshaped by experience. But the wax of our memories does not just form impressions, it also forms connections, from one memory to the next. Philosophers like John Locke believed that memories connected if they were formed nearby in time and space. Instead of wax, the most potent metaphor expressing this is Marcel Proust’s madeleine cake; for Proust, one taste of the confection as an adult undammed a torrent of associations from his childhood. These episodic memories (event memories) are known to depend on the hippocampus in the human brain. Today, our metaphors for memory have been refined. We no longer think of memory as a wax tablet but as a reconstructive process, whereby experiences are reassembled from their constituent parts. And instead of a simple association between stimuli and behavioural responses, the relationship between memories and action is variable, conditioned on context and priorities. A simple article of memorised knowledge, for example a memory of the layout of the London Underground, can be used to answer the question, “How do you get from Piccadilly Circus to Moorgate?” as well as the question, “What is directly adjacent to Moorgate, going north on the Northern Line?”. It all depends on the question; the contents of memory and their use can be separated. Another view holds that memories can be organised in order to perform computation. More like lego than wax, memories can be recombined depending on the problem at hand. Neural networks excel at pattern recognition and quick, reactive decision-making, but we are only just beginning to build neural networks that can think slowly – that is, deliberate or reason using knowledge. For example, how could a neural network store memories for facts like the connections in a transport network and then logically reason about its pieces of knowledge to answer questions? In a recent paper, we showed how neural networks and memory systems can be combined to make learning machines that can store knowledge quickly and reason about it flexibly. 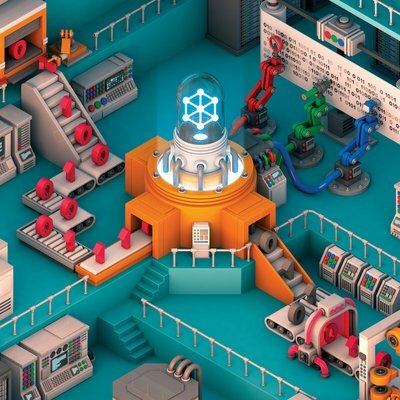 These models, which we call differentiable neural computers (DNCs), can learn from examples like neural networks, but they can also store complex data like computers. In a normal computer, the processor can read and write information from and to random access memory (RAM). RAM gives the processor much more space to organise the intermediate results of computations. Temporary placeholders for information are called variables and are stored in memory. In a computer, it is a trivial operation to form a variable that holds a numerical value. And it is also simple to make data structures – variables in memory that contain links that can be followed to get to other variables. One of the simplest data structures is a list – a sequence of variables that can be read item by item. For example, one could store a list of players’ names on a sports team and then read each name one by one. A more complicated data structure is a tree. In a family tree for instance, links from children to parents can be followed to read out a line of ancestry. 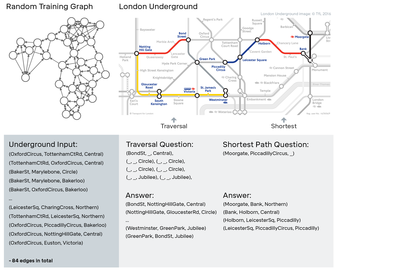 One of the most complex and general data structures is a graph, like the London Underground network. When we designed DNCs, we wanted machines that could learn to form and navigate complex data structures on their own. At the heart of a DNC is a neural network called a controller, which is analogous to the processor in a computer. A controller is responsible for taking input in, reading from and writing to memory, and producing output that can be interpreted as an answer. The memory is a set of locations that can each store a vector of information. A controller can perform several operations on memory. At every tick of a clock, it chooses whether to write to memory or not. If it chooses to write, it can choose to store information at a new, unused location or at a location that already contains information the controller is searching for. This allows the controller to update what is stored at a location. If all the locations in memory are used up, the controller can decide to free locations, much like how a computer can reallocate memory that is no longer needed. When the controller does write, it sends a vector of information to the chosen location in memory. Every time information is written, the locations are connected by links of association, which represent the order in which information was stored. As well as writing, the controller can read from multiple locations in memory. Memory can be searched based on the content of each location, or the associative temporal links can be followed forward and backward to recall information written in sequence or in reverse. The read out information can be used to produce answers to questions or actions to take in an environment. 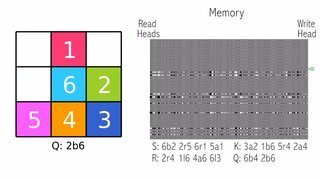 Together, these operations give DNCs the ability to make choices about how they allocate memory, store information in memory, and easily find it once there. Illustration of the DNC architecture. The neural network controller receives external inputs and, based on these, interacts with the memory using read and write operations known as 'heads'. To help the controller navigate the memory, DNC stores 'temporal links' to keep track of the order things were written in, and records the current 'usage' level of each memory location. To the non-technical reader, it may seem a bit odd that we have repeatedly used phrases like “the controller can” or “differentiable neural computers … make choices”. We speak like this because differentiable neural computers learn how to use memory and how to produce answers completely from scratch. They learn to do so using the magic of optimisation: when a DNC produces an answer, we compare the answer to a desired correct answer. Over time, the controller learns to produce answers that are closer and closer to the correct answer. In the process, it figures out how to use its memory. DNC was trained using randomly generated graphs (left). After training it was tested to see if it could navigate the London Underground (right). The (from, to, edge) triples used to define the graph for the network are shown below, along with examples of two kinds of task: 'traversal', where it is asked to start at a station and follow a sequence of lines; and 'shortest path' where it is asked to find the quickest route between two stations. 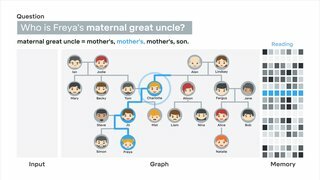 In a family tree, we showed that it could answer questions that require complex deductions. For example, even though we only described parent, child, and sibling relationships to the network, we could ask it questions like “Who is Freya’s maternal great uncle?” We also found it possible to analyse how DNCs used their memories by visualising which locations in memory were being read by the controller to produce what answers. Conventional neural networks in our comparisons either could not store the information, or they could not learn to reason in a way that would generalise to new examples. We could also train a DNC by reinforcement learning. In this framework, we let the DNC produce actions but never show it the answer. Instead, we score it with points when it has produced a good sequence of actions (like the children’s game “hot or cold”). We connected a DNC to a simple environment with coloured blocks arranged in piles. We would give it instructions for goals to achieve: “Put the light blue block below the green; the orange to the left of the red; the purple below the orange; the light blue to the right of the dark blue; the green below the red; and the purple to the left of the green”. We could establish a large number of such possible goals and then ask the network to execute the actions that would produce one or another goal state on command. In this case, again like a computer, the DNC could store several subroutines in memory, one per possible goal, and execute one or another. The question of how human memory works is ancient and our understanding still developing. We hope that DNCs provide both a new tool for computer science and a new metaphor for cognitive science and neuroscience: here is a learning machine that, without prior programming, can organise information into connected facts and use those facts to solve problems. For more information about DNC, please read our paper and an opinion piece by Herbert Jaeger about deep neural reasoning. An artist's impression of a DNC. The glowing controller network is visualised as the operator of a factory where information is delivered in the form of zeros and ones, manipulated by three robotic arms reading, writing and erasing on a scroll that represents the memory, and finally exported as a newly minted binary sequence. Our open source implementation is available on GitHub.